Life’s rich pageant is sometimes not quite what I expect. The last week or so was one of those times. I’ll start with the good times… coffee with Friend at a garden cafe. At the entrance the glade of persimmon trees was a flaming circle, though the trees have shed half their leaves. Those that are left hanging are tawny orange, and round ripe red fruit hang from every branch, decorating every twig like an elegant Christmas tree. The whole grove was a blaze of glowing colour and sound, birds perched in every tree, singing, whistling and feasting. There were tuis whose bright turquoise plumage glistened richly against the red of the fruit, acid green silver eyes flitting from branch to twig, and a host of sparrows, a few thrushes and blackbirds. The green grass sprouting after all the rain was littered with the empty flame- red carcasses of persimmons expertly cleaned out by tiny beaks. It was a busy and happy scene. Rushing up to the top of the garden, and down the road, I clapped my hands and called them – they are known as the little darlings. Easy-peasy, they came running, relieved to find a person who would look after them. Slowly I edged and skipped sideways in the fluffy slippers, and led them back down the cul de sac to where their field lay. Robert, the in-house, elderly billy-goat gave them heaps when I pushed them back into the field. They have little white pointed faces, sensitive and exquisite. Saanen goats originally came from Switzerland – these two from the SPCA shelter – neutered, and male, so unwanted since they can’t produce milk! The official description of these goats is rather charming – they are described as large, kind, and friendly. These ones are little, sweet and friendly. I thought I’d give them a handful of goat treats, and had to crawl into the back of their hut up on the side of the hill-side to get their bowl out. Before I could say knife, all three goats were in and around me, as I scrabbled for the bowl on my hands and knees and was jostled by three determined bodies, and twelve dainty legs. I finally retrieved my dignity and the bowl, and fobbed them off with the goodies. Back home and off to the big smoke with Friend for a farewell lunch with the various sprightly and foot-loose octogenarians who were about to leave for energetic tours around Germany, Italy or Alaska, we two returning to our frail husbands who cannot be left. “We were lucky to find a tour that would let over – eighties join,” said one… “We have to carry our own luggage around Italy,” chirped another. The next morning, overcome by tooth-ache, the dentist squeezed me in, and an hour later and some thousands of dollars lighter, I was the bemused possessor of half a bridge, until the whole one had been made to measure. Things went from ache to worse in that department, and I was back again, if not writhing in pain, certainly not a happy camper, a few days later. And there’s more today! Later, as I backed out of the garage in the rain to return a book to a neighbour, I heard a horrendous bang, and slammed on the brakes. Shaken I climbed out of the car to survey the damage. A wicked squalling wind had just blown off the sea, caught the very high tilt door, designed to let boats in, and slammed it down on the back of the moving car. The electric door was hanging dangerously off the runners at an angle, and badly dented, while the back of the car was chewed up, red glass from the lights scattered everywhere. I backed it out while I could still get it out of the garage. So now we need a new door, and a new back on the car. Insurance, yes, but by the time the excess is paid on both, it’s a sizeable chunk of money just for a second in the wind. Later, as I searched my soul for the reason for this kick in the back-side, I got the message. Just regretful now that I must have been so dense, and that it took something so dramatic to learn a life’s lesson! And all the while there’s blogs to read, and birds to feed. The tuis and wax-eyes, and blackbirds love the apples and persimmons I nail onto the fence-line, so I can watch them from the sitting room window. And now I’m looking for a Perspex or glass bowl to hold frozen peas and frozen sweet corn. This is food for wood pigeons. Both the loquat fruit and the guava harvest having failed after the drought this year, the pigeons are hungry and likely to starve through the winter. A bird rescue centre advises us to put the food in a glass bowl so the pigeons can see them, and wedge the said bowl in a pururi tree… in my case, it’ll be the guava tree which they already know, and which I can reach easily. “Bit expensive, isn’t it?” murmured my other half un-easily. “That’s the price we have to pay for preserving our wild life,” I returned briskly and pompously. But it did the trick, and silenced the poor chap. So this is life these days… in ‘The Pursuit of Love’ Nancy Mitford once described this humdrum of ordinary existence as the wholemeal bread of life… and so it is… but even so, I sometimes long, like Kubla Khan, to feed on honeydew and drink the milk of paradise. So as I went to put another log on the fire last night, I was thinking to myself that yet again, I hadn’t done much with my day, when I remembered Michel de Montaigne’s wonderful words. He was a lovely man and a writer and philosopher in sixteenth century France, who has often cheered me up and given me confidence, since most of his writing is about himself and his thoughts… like mine! In his essays he used anecdotes and personal ruminations which his contemporaries thought was self-indulgent, and detrimental to proper style. But he said: ‘I am myself the matter of my book’, and his popularity has lasted, while his critics have disappeared. His words which came into my mind were: “Alas, I have done nothing this day! What! Have you not lived? It is not only the fundamental but the noblest of your occupations”. Thank you Michel de Montaigne – that gives me a whole new appreciation of my wholemeal bread! 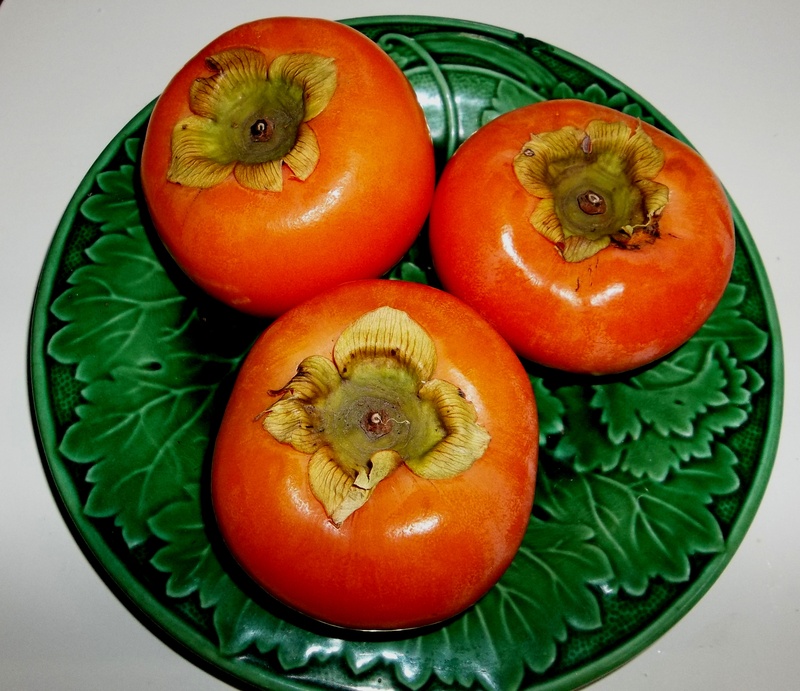 Persimmons and pigeons, goats and garage, the daily bread of life, they all have a place in the hidden scheme of things… and my part is to love them and live with them, and value them, and to remember that this is a noble occupation. Wet, cold wintry weather demands hot, satisfying stodge, so to ring the changes I decided we’d have onion tart. First step is the shortcrust pastry shell, in this case I’m afraid, ready-made, not my normal style, but needs must…. While it’s baking blind in the oven for ten minutes, I peeled and gently sautéed eight big onions – plenty- in four ounces of butter. Don’t let them brown, but gently cook until they’re a soft yellow mass. Beat an egg with two tablesp of white wine, stir in quarter of a pint of cream, salt and black pepper and a good pinch or grind of nutmeg. Stir into the onions, and cook very gently until it begins to thicken, then pour into the pastry case. Return to a moderately hot oven for about thirty minutes, until the top is lightly browned. You can also add two ounces of dry grated cheese like Gruyere. Kindness in another’s trouble, courage in one’s own … motto of Princess Diana 1961- 1997.